I received a B.A. 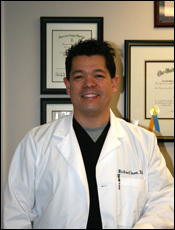 degree from Albion College in 1990 and obtained a dental degree at the University of Michigan in 1994. Education has never stopped for me. Since dental school I have pursued advanced training in implant reconstruction, oral sedation, cosmetic dentistry, endodontics, and orthodontics. I have developed a special interest in performing Oral/I.V. Sedation dentistry as well as orthodontics for children and adults. I take pride in my work and treat all my patients the same way I would treat my own family. I am especially forcused on providing a comfortable dental visit for every patient. The combination of compassion, expertise, and patient education allows me to alleviate my patient's fears and anxiety. I expect all my staff to operate at the same standard as I do. I've practiced dentistry for 15 years and still love my job.